Today I have another post that I wrote while I was taking a break - I didn't get as many written up as I'd hoped partly because I spent my time working on my thesis but also because, in my spare time, I was mainly obsessing over Henry Cavill and playing Animal Crossing: New Leaf. It also means the ones I wrote were a bit lacklustre but, well, here this one is, anyway! The other week when I was getting ready to go out for a night of dancing, I realised that I preferred the dress I'd put on when I had longer hair. It still looks really nice and I liked wearing it but I felt it worked better when my hair was longer. Or maybe I'm just longing (ergh, sorry) for long hair so much that I think everything I own looks better with long hair? Who knows? Ha. 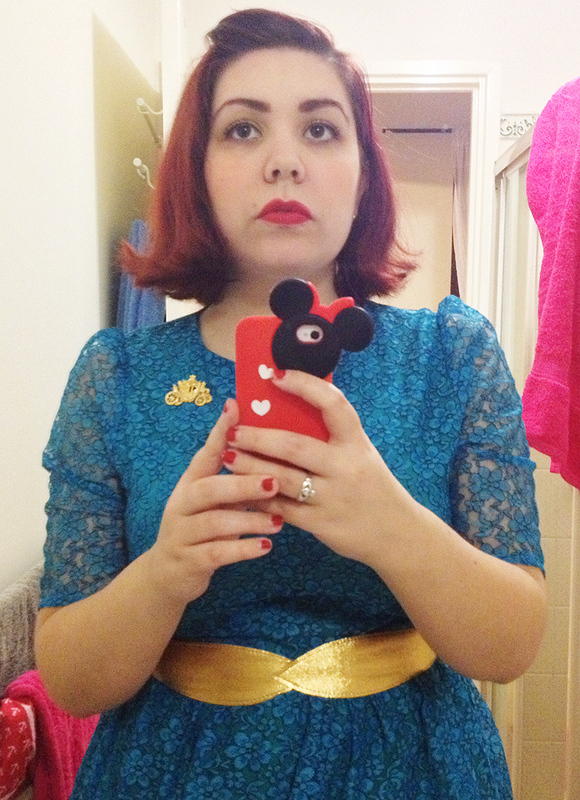 One benefit of shorter hair is that the princess sleeves are easier to see, though. But look at my long, shiny hair! Sigh. I actually think shorter hair suits me better but I just prefer having long hair (until I get fed up of long hairs all over the house, its heaviness and spending more time than I care to think about drying it). And the first time I ever worse this dress! It's a good dress to wear out dancing, even if it does get a little warm. Anyone else ever like an item of clothing better or worse when you've changed your hair? I know I've done the same thing when I've dyed my hair a different colour, too. I've only ever really had one hair style in my adult life - incredibly long, straight hair with a straight fringe - so I can't say I have experienced what you have. However, I can definitely relate to finding long hairs all over the house and constantly carrying around at least 1.5 kilograms of scalp weight. Not to mention the awful, cold, soggy feeling on your back while you wait for it to try! I am way too chicken to cut it all off, even though I sign and swoon over haircuts like yours. I have got weirdly attached to my long locks and they are like a limb that I don't want to lose. Ughhh. Anyway, your dress is adorable. That colour is super good and it looks good on you regardless of hair length. The newer cut is very 60s girl group and appropriate. My boyfriend has promised me a 3ds when I finish my thesis. I will ask for your town code at the end of the year! I think the dress still looks great with short hair. I was afraid when I went from blonde back to brunette my clothes wouldn't work anymore. But this wasn't the case at all. I'm in the process of growing mine out since i have had it short for pretty much 6 years. I've noticed that I'm drawn to different things at different stages of my hair. 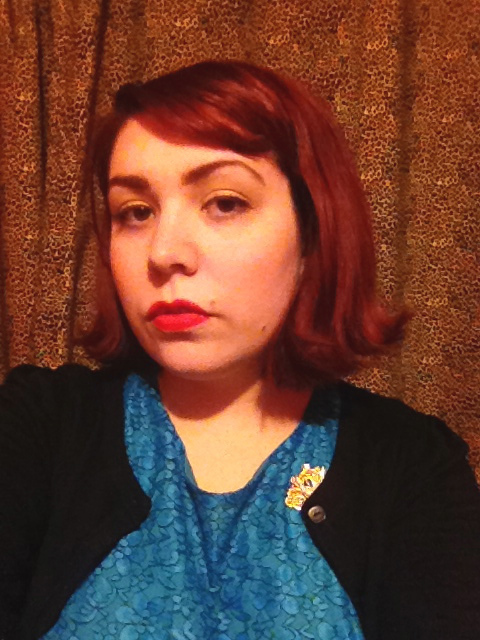 Right now, I'm all 50s inspired because my hair is the perfect length for 50s but too short for 40s looks. And I have the hardest time dressing myself for the first few weeks after I decide to go red head again. The nice thing about hair is that it grows back so you can always shoot for something new! Your bob is SO adorable; you do suit it well!! Love the little '60s flip! I've had my hair short for so many years now I forget what it looked like long! I think your hair looks great, both short and long. It's especially cute short with that dress. It's really neat that you also feel like certain items in your wardrobe work better with short/long hair. I've run into that numerous times, too, over the years. Love the fun little 1960s flip up on your pretty 'do here - it suits you so well and is as cute as a button! I think you look gorgeous in all the photos.